Gay Men To That!! : Ex-Gay "Poster Couple" Anne & John Paulk Not So Ex-Gay And Not So Blissfully Wedded? 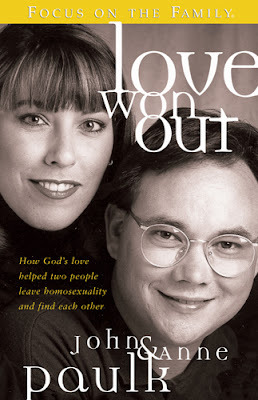 Ex-Gay "Poster Couple" Anne & John Paulk Not So Ex-Gay And Not So Blissfully Wedded? Homophobia has ruined so many lives. Men like John Paulk try to deny their true selves, pretending that Jesus can cure their God Given Gayness. They, in turn, create more hatred towards gays and lesbians. He is to blame for his own pain as much as the homophobia he supported is. Gloating about a failed relationship doesn't help either. It may feel justified, but this is a sad situation all around. The silver lining is he may finally be learning to love who he is. A few months ago John Paulk, the former chairman of "ex-gay" group Exodus International and a poster boy for the movement, changed his Facebook page to say he's "interested in men and women." Now the LGBT group Truth Wins Out reports that John and wife Anna, another activist in the "ex-gay" scene and John's co-author on Love Won Out, are splitting up and that Mr. Paulk has been dating men. Sources tell Truth Wins Out today that John has moved out of the couple’s Portland, Oregon home. Other sources in Portland have informed Truth Wins Out that Paulk was dating a man, although the current status of that relationship remains murky, and that Paulk has frequented homosexual establishments in the city. Paulk also recently penned a Facebook message about his wedding date, writing, "Although a lot has occurred since that day long ago and I am on a hard journey right now, I want this woman to know how much she has always meant to me and that no matter where things pan out."